Like myself, anyone can lose their balance due to the rugged obstacles throughout life. Instead of spending time putting emphasis on losing balance, I would much rather glorify the moment when you realize your mental balance has been restored. In my photo above, I captured an image that symbolizes the restoring of balance that personally represents the difficult year I’ve overcome. 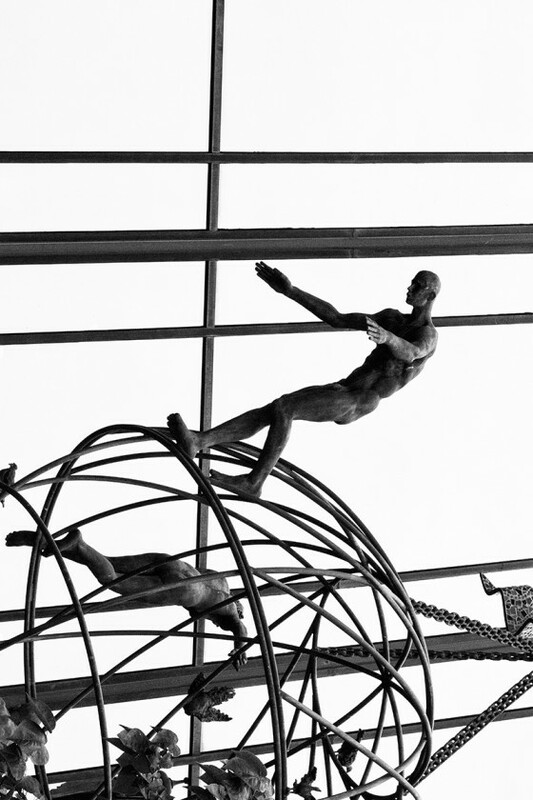 When I first focused in on this sculpture from across the street, the man in focus was walking or falling down the globe structure. Within that split second I related myself to this oversize sculpture and wanted to share that moment in the positive way I choose to perceive it. The best way to accomplish this was for me to rotate the photo ninety degrees to the right. Now I ask, instead of falling why can’t he be regaining his balance and finding his stability on the awkward foundation he has found himself on? Every challenge we take on has the power to shake us. When we feel the ground beneath us shifting, we become uneasy. We forget everything we know and allow fear to affect us. Just the thought of what could happen is enough to throw us off balance. What I’ve learned is that the only way to endure the quake is to adjust your stance. These experiences are really gifts that force us to step to the right or left in search of a new center of gravity. Don’t fight them. Just find a different way to stand. When one feels off balance and as if they’re sliding down hill, simply turn the perspective of your situation and realize that by one slight rotation of thought, you can completely turn an unbalanced mental state, into a regained balance and stability. Balance lives in the present. In this very moment, you’re still breathing, you’ve survived and most of all you’ve found a new place to move your feet so you can step onto higher ground.